The Infosys Foundation has been a public champion of Akshaya Patra's cause of eliminating classroom hunger in India. 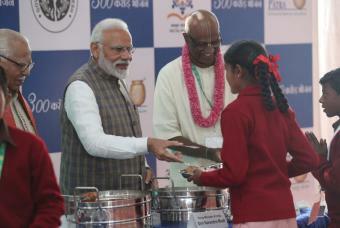 Narayana Murthy Founder of Infosys Limited and Sudha Murty Chairperson of the Infosys Foundation, have been active participants at Akshaya Patra events spreading the message of the need to provide food for education to every underserved child in India. View the videos to watch Narayana Murthy's speeches in support of the programme.